Planning to cook up some cast iron skillet recipes? 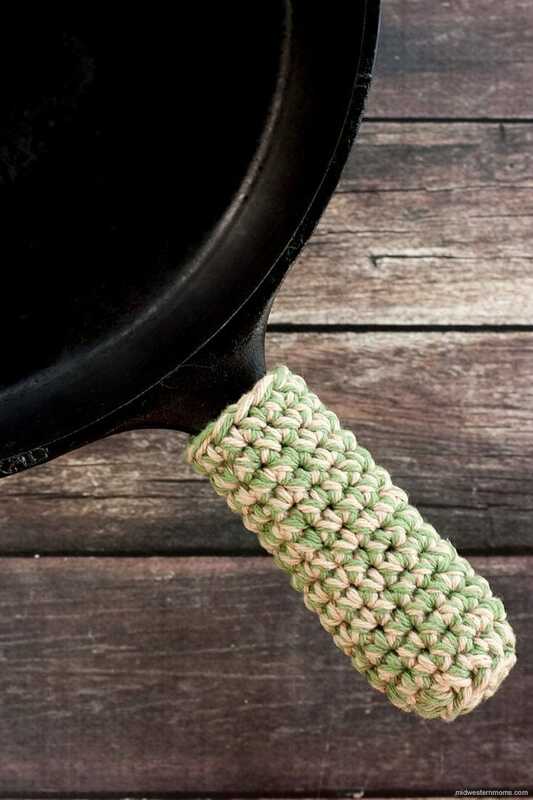 Save your hands and make a handle cover with this easy crochet cast iron skillet handle cover pattern! The weather is warming up and people are starting to think about camping. The number one cookware for camping is cast iron. However, cast iron is also becoming fun to cook with on the grill and in the oven. Boy, I have seen some delicious desserts made in a cast iron skillet. 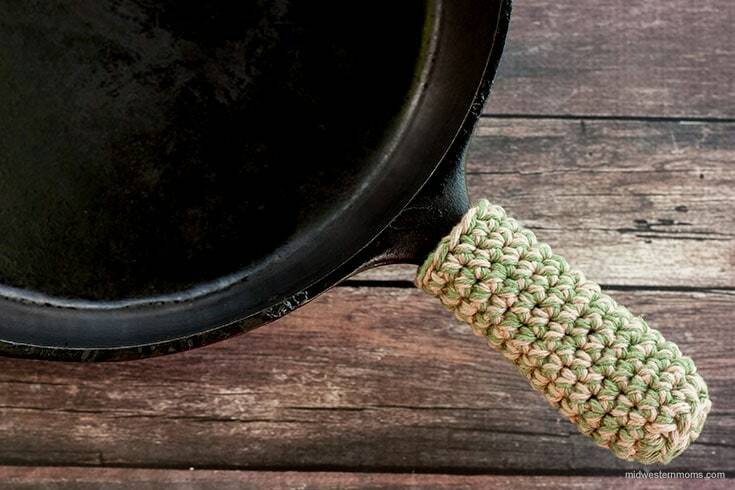 If you are looking for some cast iron skillet recipe ideas, check out my friend Jen’s blog, My Crafty Life. She has several cast iron recipes for you to try. I thought it would be neat to make a handle cover that a person could slip on to the handle and help protect their hands from the heat. 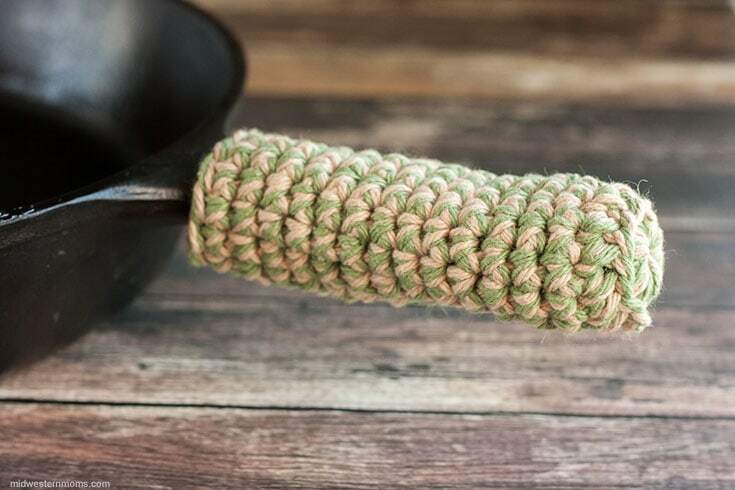 Sort of like a pot holder for the handle. So, I got up my cast iron skillet from the garage. Cleaned it up and re-seasoned it. Since it is going to help protect hands from heat, I chose to use two strands of cotton yarn. It just makes it a little bit thicker. Also, I only used single crochet stitches. This way there are fewer holes for the heat to seep through. Only use 100% cotton yarn. Acrylic yarn will melt. 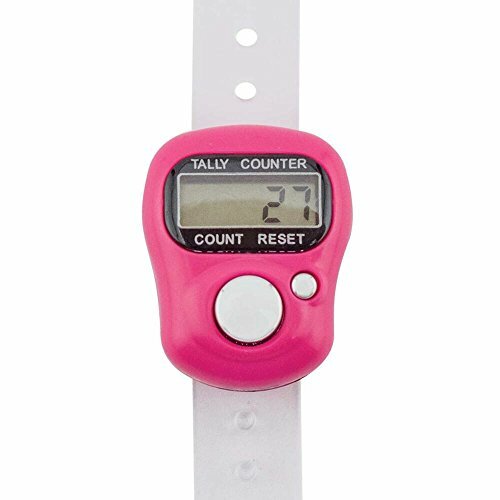 If you need help counting rows, try a digital counter – I love mine! FYI – the skillet I modeled this from is a 12-inch skillet. Adjustments may need to happen for other sizes. 100% Cotton Yarn – 2 balls of yarn so it can be made double thick. Round 1: Using 2 strands of yarn: Start with the magic circle, Chain 1. Then single crochet 12 stitches. Pull the tail of the magic circle to close the circle. Make sure it is tight. Slip Stitch to join. Now is the time to weave in the ends of yarns. You will not be able to at the end. Round 2: Chain 1. Single crochet 12 stitches around in the Back Loops Only. Slip stitch to join. Round 3 – 15: Chain 1. Single crochet 12 stitches around. Slip stitch to join. Once you finish round 15, cut the yarns and weave in the ends. Want to print this pattern? Simply put your email in the newsletter box below and an email will be sent to you with a link to print the pattern. It took less than a ball of yarn per color. Thank you so very Much for this easy to use pattern. My friend and I love❤❤❤, cast Iron cooking, and are quite avid collectors of all size skillets, nothing tastes better than out of a cast iron pan.. 😃😃, thanks for sharing this, !! Do you have a finished size for the pattern?? It is about 4.5 inches long and the diameter of the circle is about 1.5 inches. Thank you can’t wait to make the handle cover. I have my husband’s grandma’s skillet and a flat griddle. I make pineapple. Upside down cake in my skillet. It is perfect timing that you posted this now. I have been wanting to get a cast iron skillet for awhile and I finally bought one the other day. Now I can make this handle cover for it. Thank you so much for sharing.